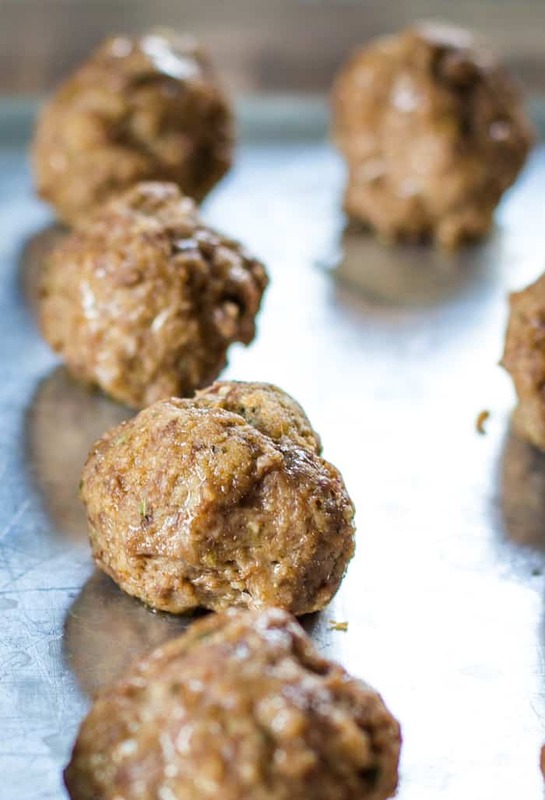 This easy meatball recipe makes the best homemade baked meatballs! 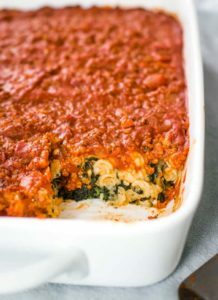 You can make these ahead and freeze them for a busy day or add them to a big plate of noodles and spaghetti sauce for a simpler delicious dinner. Sure, it’s easy to rip open a bag of meatballs you bought at the store. But I found this easy meatball recipe that’s almost just as simple. I was looking for some easy recipes with ground beef in my little recipe box I received for our wedding. I thought it was about time I started using these treasured recipes that people gave us before my husband and I were betrothed. This is a great meatball appetizer recipe since they’re a tasty meatball with the addition of nutmeg. They go great with the little smokies sauce or you can also enjoy them with spaghetti and noodles which is what I did. This recipe is easy. Remember, I was looking for easy recipes with ground beef. It’s made with pantry ingredients. I like fresh green peppers and onions like the next girl. 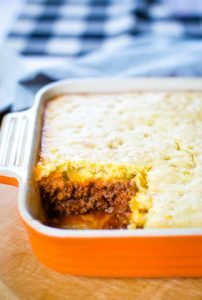 However, sometimes the cupboard is bare and for this easy recipe, you’ll only need ground beef and you spice cabinet. Oh, and some milk. But with two growing boys in the house – we’re never out. You? It’s great for freezer cooking. I’ve been really wanting to freezer cook more. One day I had the epiphany that sometimes it’s nice to not cook every day and avoid take out at the same time. I decided to dive in and start preparing more meals ahead of time. 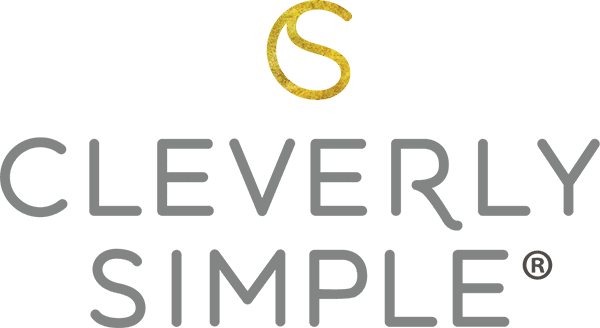 Here’s the big news. 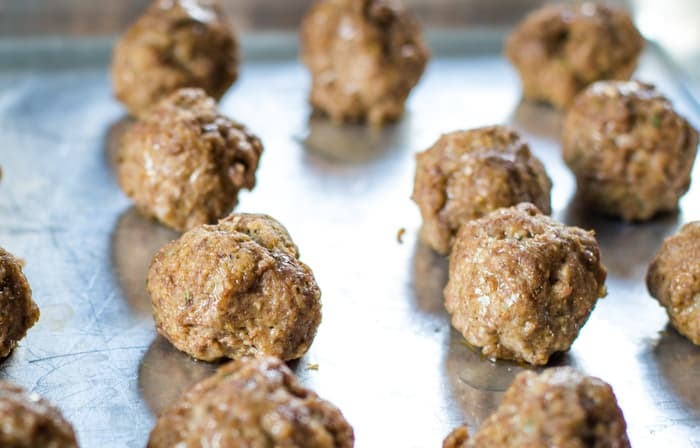 It’s no more work to make 3 pounds of meatballs, than it is to make 1 pound of meatballs. Why did I not take advantage of this more before? Combine all ingredients in large bowl. I received mixing bowls for Christmas that were perfect for this. To mix, I prefer using my hands. There’s no better way to mix a meatball then to just get in there. Mix thoroughly. Roll the meatball mix into 1.5 – 2 inch balls. I used my scoop to quickly grab the needed amount and keep them uniform. Roll them between your two hands. If you’re planning to freeze these, placed them in shallow baking tin. 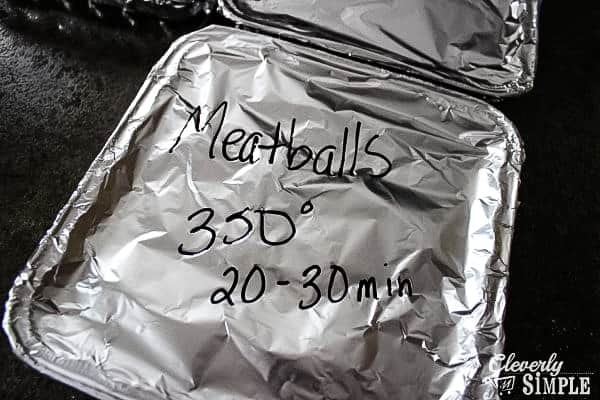 For Freezer Cooking: Place foil over the basic meatballs and used a Sharpie to create a label. You don’t want to have to look up the recipe for the cook-time later so always label them with the temperature and time. To Bake Right Away: Bake at 350˚ F for 20 – 30 minutes or until fully cooked. 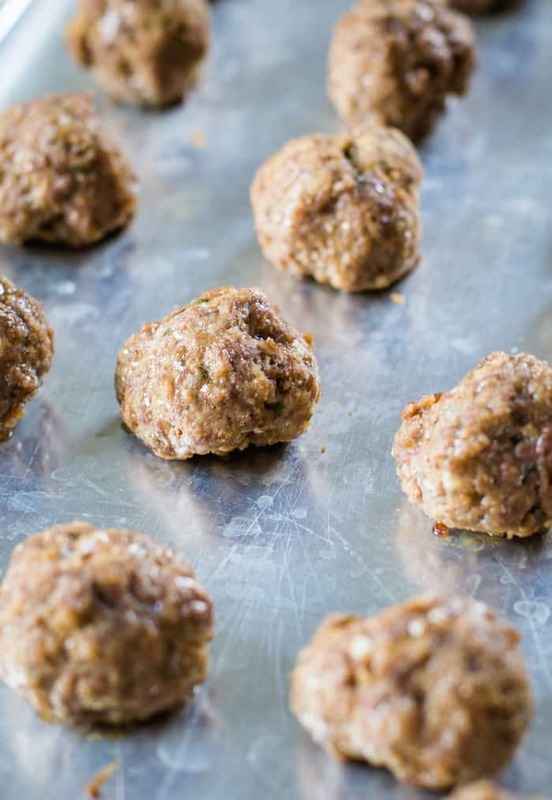 Should you cook the meatballs before you freeze them? It’s up to you. If I am going to use them to top spaghetti I will freeze them raw and then cook them before serving. If I’m going to throw them into the crockpot with a big jar of spaghetti sauce, then I’ll pre-cook them and freeze them. 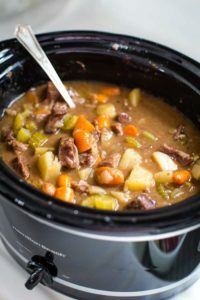 I just throw them in the crockpot frozen with the sauce and let them cook all day long. Can you bake meatballs in a crockpot? 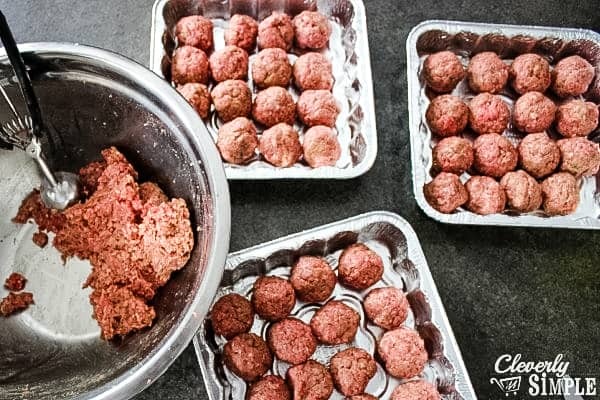 Bake the meatballs before placing in a crockpot with sauce. How much ground beef per person? 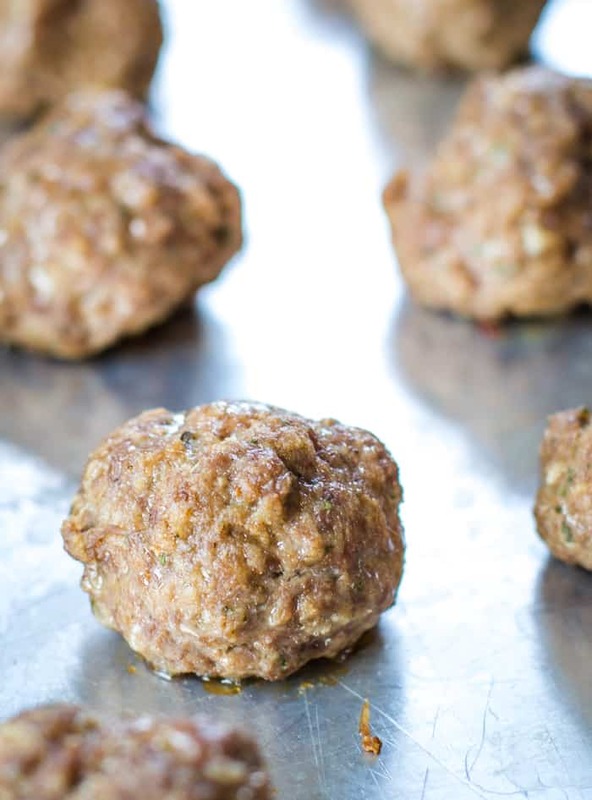 One pound of ground beef will make 22 meatballs with this recipe. I would plan on 1/4 ground beef per person. 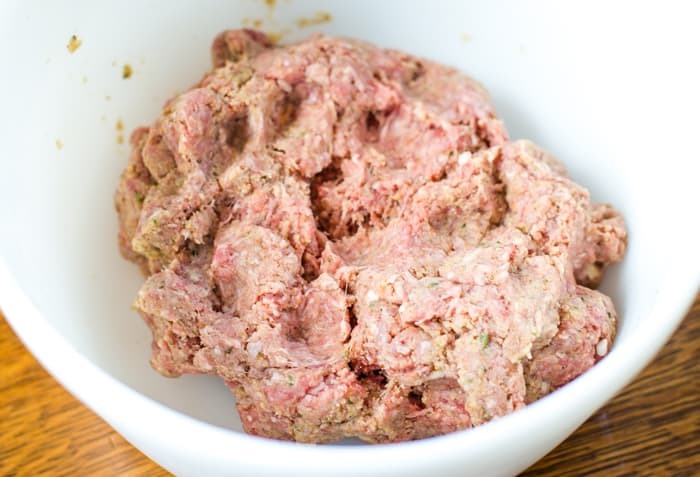 What fat content of ground beef makes the best meatball? I used 85% for this recipe. Using a more lean hamburger will make the meatballs more likely to crumble. 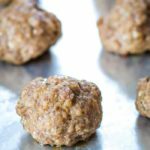 If you’re like me and you’ve been looking for a great recipe to make in batches, this easy meatball recipe is it. Grab a jar of spaghetti sauce and make dinner happen. Enjoy! 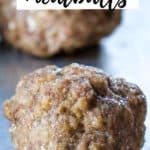 Baked easy meatball recipe made with ground beef and pantry ingredients like nutmeg, dried onions and Italian seasoning. Perfect for dinner tonight or ready for the freezer to save for later. Mix all ingredients together in large bowl. Mix well. Roll into 1 1/2 to 2 inch balls. 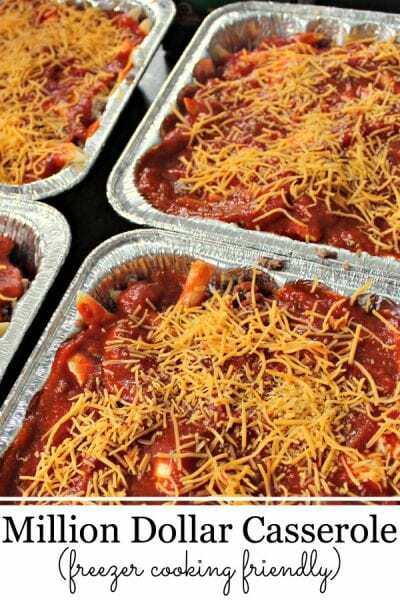 Bake the meatballs in a preheated oven at 350 degrees Fahrenheit for 20 – 30 minutes or until cooked through. 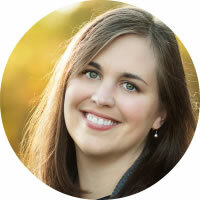 To use for freezer cooking you can freeze after fully cooked to use in crockpot recipes. You can also freeze before baking and following the oven baking instructions above. I typically triple this recipe to make a batch for dinner but also two additional batches to freeze. I prefer baking them and then freezing so that I can throw them in the crockpot with spaghetti sauce for an easy dinner. This recipe was originally published in 2014. Thanks for the feedback! 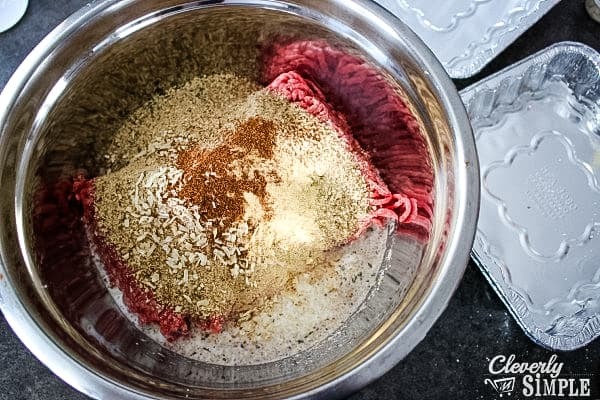 What fat content did your ground beef half? If the fat content is too little these will crumble. I would suggest using at least 86% if not a more fattier ground beef.